Alaverdi, a small industrial town spread on the hillsides of the narrow Debed river canyon, holds a copper smelting giant in its claws. Situated about 160 kilometers north of Yerevan, in Armenia’s Lori province, Alaverdi is one of the largest industrial centers of the country, as well as an ‘apple of discord’ between environmentalists and mining companies. 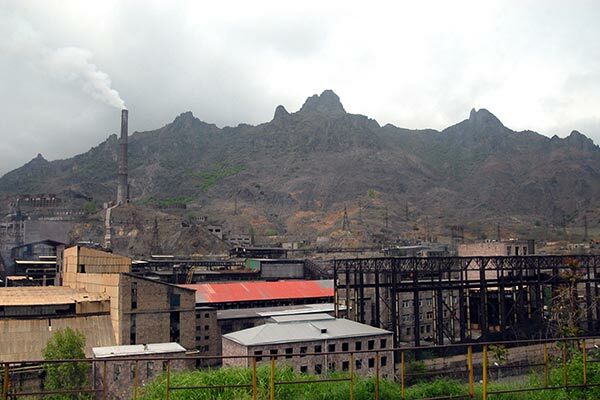 Still in the 18th century Greek miners built a plant in Alaverdi, then in 1887 it was developed by the French, and in the 1960s Alaverdi joined the ranks of Soviet towns as a major ferrous metallurgy and chemical industry centers. Alaverdi’s copper smelting plant is the only full-cycle plant in the entire South Caucasus, but only the lower floors used for ore extraction and enrichment are operated today, which is done to preserve the environment of the Debed river valley. Only tumbledown, plundered and empty production facilities occupying a vast territory in the town are testimony today to the town’s once industrial glory. The current image of the town is reflected in the sky in the form of a thick layer of dust formed out of copper smelting plant emissions and waste. Despite warnings by environmentalists that the situation in the town is critical, that it is the cause of respiratory diseases, tumors, the folks in Alaverdi skillfully circumvent these views and have their own justification. “It was worse in the Soviet times, there was no air to breathe, now it has become a bit better. But what should we do? This is our job. Should we work? If the factory closes down and 600-700 people have to leave Armenia, what will be then?” says 53-year-old Alaverdi resident Suren Sargsyan, who also works at the local plant. Manes & Vallex CJSC, which is part of the Vallex Group Companies, in 1997 revitalized the copper smelting plant after it idled for several post-Soviet years. In 2002 Manes & Vallex was renamed Armenian Copper Program (ACP). Vallex Group Companies spokesmanVahran Avagyan says that as of late October 2013 the ACP company had 663 employees, whose average monthly wages as of the same month was about 180,000 drams (about $450). Alaverdi deputy mayor Artur Varosyan says that the town has about 14,000 residents, and the main employer in the town is the ACP plant providing job to 80 percent of local workers. Some 400-500 Alaverdi residents are employed in the nearby Teghut mine. According to Varosyan, as a result of concerns voiced by the town authorities and environmental for years in 2012 the company relocated the main source of emissions, the chimney, from the height of 780 meters to that of 1,078 meters, and according to industry officials, the air pollution in the town has been substantially reduced. Still, Ecolur NGO head Inga Zarafyan told ArmeniaNow that while there is a positive difference in the emission data for 2008 and 2012 the situation in general is far from being good. “If in 2008, the situation was critical, then in 2012 it quite normalized, but in order to overcome the 2008 critical situation they only relocated the pipe, transferring the situation to another place, the forest. Now the forest is virtually disappearing, as it can’t stand these emissions,” said Zarafaryan, adding that the company should install filters and use new technology. People in Alaverdi do not like talking about public health in their town, meanwhile many diseases there may have been caused by the level of air population. Doctors also prefer not to speak about problems. They give assurances that no abnormal births have happened in the town in recent years. Roza Machkalyan, who has worked at the Alaverdi Medical Center’s maternity ward for more than 30 years and is now head of the maternity welfare clinic, says that in the 1980s, when 900-1,000 were born annually that had up to nine such cases, whereas today when the number of annual births reaches 400 they have two or three cases, while defects incompatible with life are diagnosed and prevented. “This year there were two cases of a fetal abdominal cyst, but the mothers preferred to give birth. We mostly blame ecology, but today a lot of efforts are made to improve it. Social conditions have also improved. Alaverdi’s municipality provides food to our pregnant women,” says the doctor . Vice-mayor Varosyan says the Alaverdi community receives funding from the Ministry of Nature Protection which in 2013 amounted to 110 million drams (about $272,000), in 2014 it is planned to be at the level of 120 million drams (about $296,000), of which 40 million drams will be provided for the construction of a park, 10 million drams for purchasing new trash cans for household wastes. The funding will also be used for providing vitamins for 425 children attending kindergartens, food for pregnant women, other activities.